Are You Looking For a Dissolution Lawyer? For more than 30 years, the Gottfried Law Office has served Ohio clients with excellent uncontested divorce or dissolution cases. Our attention to detail in your specific dissolution is crucial to making your case that much easier to go through. Our lawyers are very experienced and never fail to meet your needs and answer your legal and personal questions. We provide unparalleled personal attention to your questions and need through an uncontested divorce and marital dissolution. A dissolution is an termination of a marriage by agreed on by both parties to reach an agreement on all issues through the separation. 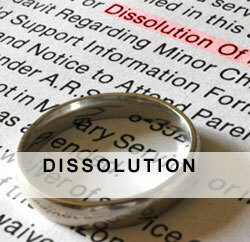 During a dissolution, we do not discuss the reasons for the break-up or any allegations of fault. All issues are to be resolved before the dissolution can be filed. Then, we take the paperwork to be filed with the court. You will find our Family Law Attorneys' expertise to be greatly beneficial and supportive throughout your divorce. Divorces involving significant assets and high-profile individuals involve a number of issues that are not common to other divorces. At Gary J. Gottfried Co., LPA serving Worthington Ohio, we have significant experience handling substantial asset cases. Our attorneys regularly represent both men and women dealing with the personal, business, and financial issues associated the dissolution of a marriage. What is a dissolution of marriage, and how is it different from a divorce? A dissolution of marriage process may eliminate much of the divorce process and expense. Unlike a divorce, fault grounds are not at issue. Dissolution is often thought of as no-fault divorce. Do You Have Additional Legal Questions About Dissolution? As specialists in Divorce and Dissolution Law, we are always available to respond to your legal needs and would welcome the opportunity to assist you. Did You Know? Franklin County Has Most Divorce and Dissolution Cases in Ohio… Contact an experienced divorce attorney to help you with your case. Our law firm proudly service Upper Arlington Ohio with experienced legal advice. A divorce layer can help you through this emotional process. Schedule an appointment with us today and we will be happy to help you with the legal process. Westerville Family Law Office Serving You! Our Family Law offices are in Westerville, but our dissolution attorneys provide legal service nationally, internationally and within the city of Upper Arlington OH. Gottfried Law is is a highly rated dissolution attorney with over 30 years of courtroom expertise. We are a Top 50 Family Family Law firm representing Ohio. If you need legal advice within the realms of family law, then be assured that our specialized divorce attorneys are here to help!